So good. The price / performance ratio is sweet. You can handle all the gaming like GTX 1080 paying so much less. It have that RGB looks everybody likes and all the VR, 4K features. I think it is the best deal. Great card running average of 2000mhz stable and stays remarkably cool at full load. The only issue is the price although it's the same for most all graphic cards at the minute. 65c under load with an OC, this card is great for anyone wanting a powerful but quiet build. Although a bit overpriced at purchase time, the 1070ti upgrade has been really fantastic. The base clock on the 1070ti is where I'd typically have my 970 OCed to, making temps more reasonable on the 1070ti, and providing more headroom to push it further. Adding the custom loop really enabled pushing this card to the next level! For a while I've been debating on which GPU to pickup for this build. 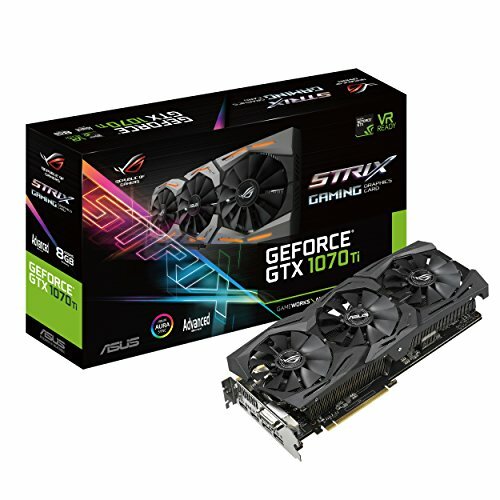 Considering the prices for GPUs are insane due to all the crypto mining craze AND expectations for the "1100 series" GTX to be released soon, it makes it hard for me to decide on what GPU to choose NOW. 1) it may be much longer than everyone thinks before the GTX 1100 series are available for purchase. 2) AMD RX and Vega cards cost much more than they are worth IMO. 3) I'll sale this card after picking up the new GTX 1100 card if its worth the trouble of upgrading. Software from Asus does not feel great. I only use it to setup the RGB light configurations and leave it off after setting it. Expensive. If it weren't for the eBay 20% sale, I would not have considered it as it's far too expensive vs competitors. 95 percent of the performance of a 1080 for $100 less; a no-brainer. Got it for a good price of around $400 - runs well, looks good. I got it for a great price at Micro Center. It performs really well, overclocks to 2.1 GHz which is past 1080 performance. Runs in the low 70s at that clockspeed. Quiet too.